This page is the archive of selected interesting playing card projects on Kickstarter, which got special mention in posts of this blog and were successfully funded in 2014. Enjoy this modest retrospective review for playing card collectors (positive and negative sides of it). Stacey Jay Kelly is a digital illustrator based in the North West of England. She has lots of experience with games design and it has been a lifelong dream of her to create an illustrated playing card deck. Stacey decided to choose quite unusual theme for playing cards. Her playing card project, Fishing for Compliments, focuses on fish that thrive in fresh water and rivers. Fishing for Compliments playing cards feature a series of beautifully illustrated aquatic characters that complete the range of prize catches. The designer of Good and Evil decks decided to create some beautiful in its craziness design for playing cards. As a result we have Delirium playing cards on Kickstarter. Delirium deck is designed by Thirdway Industries, Giovanni Meroni’s new brand of playing cards. Crazy, stylish, strange, vivid, funny… it’s all about them. These playing cards are planned to be printed by the Expert Playing Card Company (EPCC). Poker size. Successful creators of Bicycle Dia de Los Muertos playing card project on Kickstarter developed a new series of decks – The Grimoire Playing Cards. They propose the first two decks from the series (Illustrated by David Edgerly): Necromancy Deck and Elemental Magick Deck. The decks are based on ancient texts of magick, magical aesthetics of fantasy worlds and role-playing games (RPG). Court cards portray the creatures summoned and controlled by Necromancers and Elemental sorcerers – various types of undead, and spirits of earth, air, water and fire. The decks are planned to be printed by the Expert Playing Card Company (EPCC). Poker size. Bicycle Rongorongo and Moai Rongorongo playing cards inspired by scribes of Easter Island (rongorongo) and Polynesian tribal masks. They pay honour to the Rapa Nui civilization of Easter Island. Moai is a monumental statue created by the early Rapa Nui people. Easter Island is famous for its 887 extant moai. Decks were designed by the American artist Tomas Leszczynski (New York). They will be produced by his company, Matifu, and are planned to be printed by the United States Playing Card Company (USPCC). This Bicycle Metal Deck is the very first deck on a series called TEXTURE SERIES by Max (Max Playing Cards). This deck is a reinterpretation of the classic Bicycle Rider Back deck using a set of textures to give the cards a real metal aspect. The project is supported by Collectable Playing Cards (Bicycle Gods of Mythology Playing Cards). The Bicycle Metal Deck has already been approved by USPCC for printing. 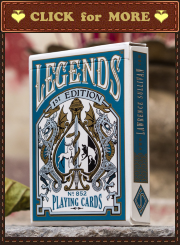 Decks are planned to be printed by the United States Playing Card Company (USPCC) and the Expert Playing Card Company (EPCC) – Deluxe Edition. Poker size. Inspired by the Dragons of lore, Draconian Spitfire and Lightning are a premium pair of custom playing cards designed by Randy Butterfield (ORNATE Playing Cards, The Crown Deck: Luxury Edition, Imperial Playing Cards). They will be printed by the Legends Playing Card Company (LPCC). Inverno and Verana are the last 2 decks in the Seasons series that began in 2011. Each deck in the series is individually illustrated to represent a different season, telling a story of a deck that changes over time. The Verana deck is a captured moment of summer. This clean white deck with metallic gold accents emanate elegance as it displays a design in full bloom. The Inverno deck is a frozen moment of winter. The stunning black deck commands attention with a perfect touch of metallic blue accents that frost the back. The rigid central structure couples with the loose flowing winds throughout for an added element of depth and contrast. These designs are created by abstracting the elements of the seasons. The style of the artwork focuses on soft highlights, bold shades, and subtle hatching to create these eye-catching illustrations. Poker size. 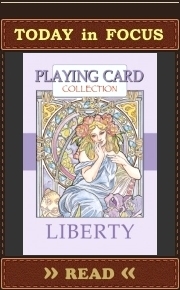 Decks are planned to be printed by the United States Playing Card Company (USPCC). 56 original pen & ink drawings inspired by the Renaissance. The face cards have 54 different illustrations drawn from the years 1066 to 1400… from the end of the Dark Ages on through the Renaissance. Plus two illustrated jester cards. And of course each deck is in its own colorful box. Bridge size. Decks are planned to by printed by TMcards (315 gsm playing card paper stock coated on both sides with a UV-cured (ultra-violet) coating). Bicycle Hundred Years’ War Playing Cards by SPAAAADE&Co. SPAAAADE&Co. decided to devote their first playing card deck to one of the longest wars in history, which lasted for more than a century, the Hundred Years’ War. Bicycle Hundred Years’ War Playing Cards are deeply inspired by the dramatic scale of the war. Every single element of our card designs are based on historic investigation and verification. 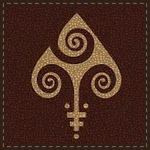 For example, aces are designed using symbols and medieval motifs that represent each dynasty involved in this war. Court cards feature the major historic figures of it. These playing cards are an attempt of a modern interpretation of the medieval costume designs and their combination with traditional court card elements (check the strips). The backs of the cards are “slightly” one way. They symbolize the confrontation of two dynasties. There are two editions of these playing cards: Bicycle Hundred Years’ War Golden and Silver Editions Playing Cards. Each edition has appropriate different metallic inks – silver and gold. Heretic Playing Cards are designed by the artist and manager behind Stockholm17 design studio, Lorenzo Gaggiotti. This is his second playing card project on Kickstarter (the first one – Requiem Playing Cards). These playing cards being based on alchemy and the hermetic world are full of heresy in many ways (the Jacks are women; the King of Diamonds has a sword instead of an ax in classic poker deck; the King of Clubs has an ax instead of a sword in classic poker deck; etc.). Salt (for the Jacks), Sulfur (for the Queens) and Mercury (for the Kings) are the three basic alchemic ingredients for these playing cards. There are two editions of them: Heretic Lux and Noctis Decks. Each edition has its own custom aces, Jokers, backs and tucks. Courts and number cards are different in some colours. These decks are planned to be printed by the Expert Playing Card Company (EPCC). JiMi Agency is a company located in South Korea. It is represented by two talented designers, Misun and Jin. They created a deck of playing cards, Animalia Playing Cards, featuring animals in job classes. Every card has its own animal/job class. Some anime style was applied. The result is really vivid and cute. There are two editions of these playing cards: Animalia Playing Cards with “sparkly” and “non-sparkly” front finish (JiMi Agency used some special finish for their 300 gsm cardboard playing cards which has appropriate effect – see below). Each deck has 61 poker playing cards: 52 Basic cards, 4 Jokers, 4 alternate Aces, & 1 Gaff card. These playing cards will be printed through a Korean company, Jo-A. Tuck cases will be made at BOXnE. This is the first deck of playing cards by an American design studio, Pocono Modern. They decided to create some unique deck of cards featuring mid-century inspired graphics and whimsical characters that could be fun for all ages – Woodland Playing Cards. Artworks are created by their leading artist, Joe Morelli. Animals instead of royals are a little bit unusual, but really pleasant. The style is both retro and modern and invokes the spirit of a bygone era while being right at home in the present. An artist from New Zealand, Rick Davidson, decided to design special playing cards which should combine modern aesthetics of Anglo-French patterns with their historical roots. The Anglo-French pattern we know today was formed around the 15th century in Rouen, France. A design emerged that was adopted and copied in England, and then spread across the globe. Rick wanted to create his own modern interpretation of the pattern based on old classic images of playing cards – Origins Playing Cards. He has made a serious research in this field. The artist has worked with card historians, museums and archives in my search for this original art. Rick’s reference material includes pieces from the Bibliothèque nationale de France, British Museum, Archives Department of Seine-Maritime, and Fitzwilliam Museum of Cambridge. The interpretation happened to be really nice. All faces are modern and elegant, but they clearly resemble old images of the Rouen pattern. There will be two editions of these playing cards: Origins First Edition Deck and Origins Grail Limited Edition Deck (only 2500 decks will be produced). Each deck will have its own colour scheme for tuck cases, backs, and faces of playing cards. The Playing Cards are going to be printed by the United States Playing Card Company (USPCC).